The Nike KD VII ‘On The Road’ is a straightforward team-based colorway for the Oklahoma City Thunder. The reigning MVP’s latest sneaker features a black mesh and Hyperposite upper, accented by photo blue and crimson. 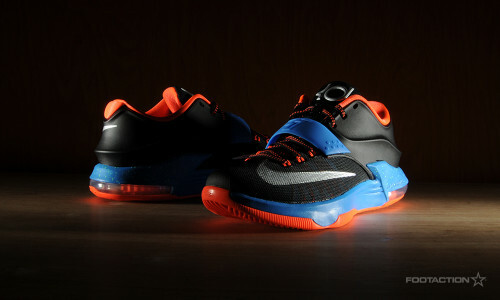 The KD branding on the tongue and the forefoot Nike Swoosh keep a Metallic Silver color. The strenuous marathon of a full NBA season, and the pacing that’s needed to perform consistently throughout, is one of the most difficult challenges that often flies under the radar. With the 2014-2015 season right around the corner, this sneaker arrives just in time. Print article This entry was posted by hhcblog on October 25, 2014 at 5:30 am, and is filed under Footwear. Follow any responses to this post through RSS 2.0. You can leave a response or trackback from your own site.